– or, to give it its full title, The Pirates! In an Adventure with Scientists. This animated feature from Aardman Studios was released in March 2012. 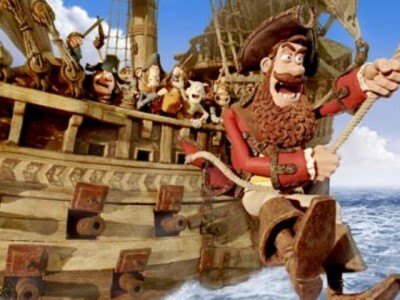 It’s the story of a Pirate Captain and his crew of (mostly) idiots, who in their quest to win the “Pirate of the Year” award for the captain, embark on an exciting and very funny journey featuring a dodo, Queen Victoria, a monkey, and the young Charles Darwin. The movie is based on a book of the same name by Gideon Defoe. Andy Riley and Kevin Cecil contributed a lot to the early story work, wrote a draft of the screenplay, and helped out once more with a layer of extra jokes in the final stages of production.